Over the summer I bought a styrofoam ring to make a life preserver style wreath for the door but just never got around to it so after a coat of orange spray paint it was ready to use for Halloween. Last year I had a wooden skeleton hanging on our door but it blew around in the wind and banged into the door so loudly that there's no way it was going back on there this year. I decided a 'quiet' wreath out of styrofoam would be better. Black and orange spray paint with polka dots can be considered quiet, right? After the coat of orange spray paint dried, I taped off stripes. When I had them lined up how I wanted, I went around and really pressed the tape edges down because I thought there might be a lot of bleed through with painted foam. To finish the painted wreath I went through my stash of Halloween gear and found skeletons and bats. Because they open down the middle and never seemed practical as boxes that would hold anything I decided to split these cardboard skeleton boxes and use them for accents on the wreath. I covered them with a couple of coats of black spray paint. I topped the wreath with a paper bat and tied a polka dot ribbon on the bottom. 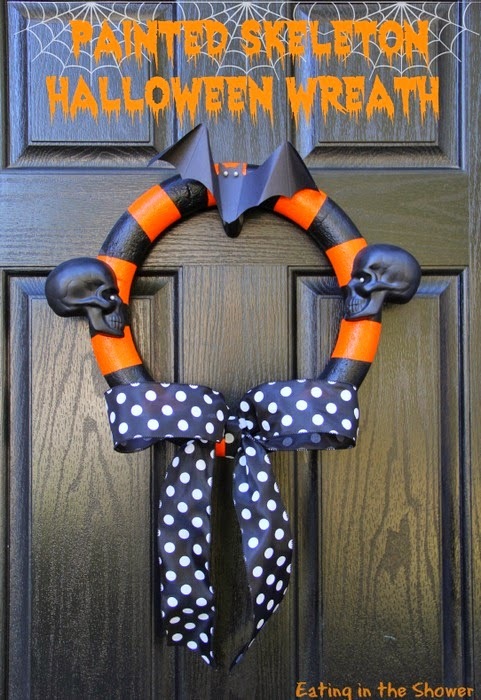 Corsage pins served double duty and both fasten my spooky flare onto the wreath and give the bat and skeletons eyes to glare at the trick-or-treaters coming to the door. Now I'm ready to start the rest of our Halloween crafting and decorating!